The DeVonna Home Show presents 11895 Riverbank Road in Gilroy, California 95020. Coming Home is down a welcoming entrance lined with beautiful trees and a circle driveway. Take a moment to experience this European inspired home with its prestigious serenity among the vineyards of South Santa Clara County’s wine trail. 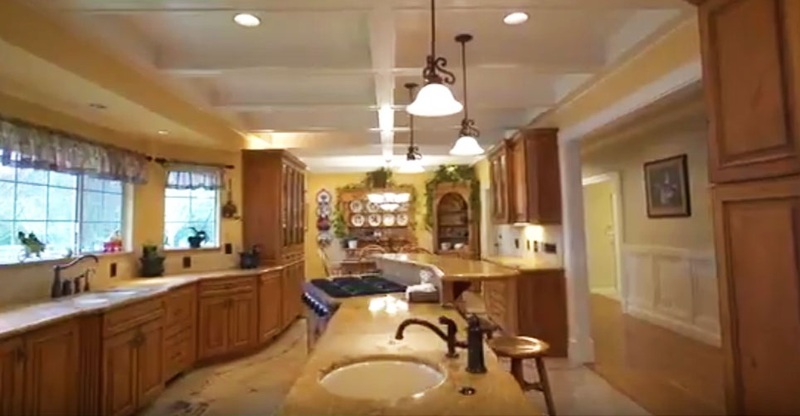 This impressive custom home is five bedrooms and four baths with 4,879 sq. Ft of living space that is designed for elegance and family fun with lots of areas for activities or just pure relaxation. This luxurious, dominantly single level home, is easy living with masterful coffered ceiling architecture and custom-tailored wainscoting hall accents. he masterfully curated grounds include 2.9 acres of endless opportunity for family activities including a sport court, pool, spa, private playground, fruit trees, gardening shed, and fenced garden area. Picture your own Easter egg hunt, croquet challenge or plan a wedding on the expansive lawn area, perfect for your family gatherings and friends to enjoy. Your own private gazebo is meant for a quiet conversation or morning coffee while you enjoy the sound of nature or watch the kids play. End your summer days next to the Babbling Creek. DeVonna has a proven track record in the Gilroy real estate market, having sold some of the city's most exclusive properties. If you're looking to buy or sell a home in Gilroy, look no further and contact DeVonna today.